Background: Right after opportunistic fungi become pathogenic, they face immune system cells including macrophages and neutrophil leukocytes. Although the relationship between fungi and immune cells are being widely studied by using animal models and culture techniques, cervicovaginal smears have not been used to evaluate this interaction yet. Aim: The aim of this study was to investigate the interactions between fungal infection, macrophages and neutrophil leukocytes in cervicovaginal smear. 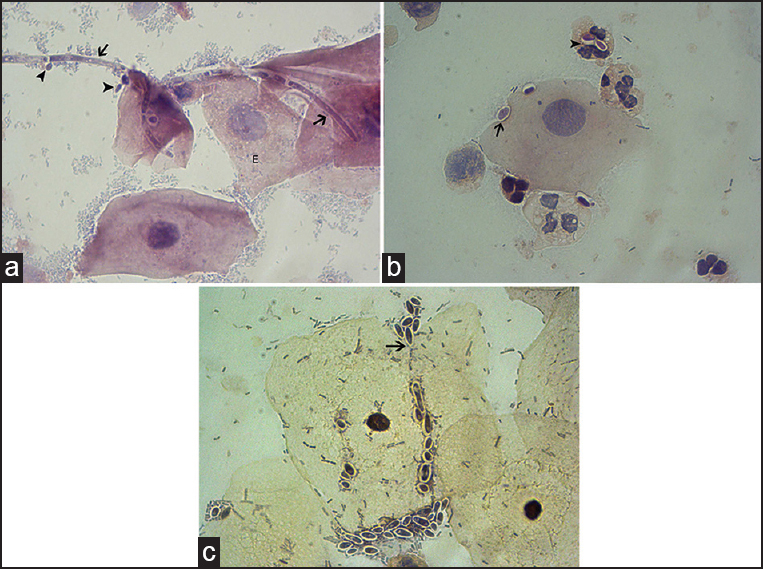 Materials and Methods: Papanicolaou-stained cervicovaginal smears from 2307 women, aged between 18 and 73 years, were examined by light microscopy. Periodic acid-Schiff stain was also used to confirm the presence of fungal cell walls. Results: Fungal infections were detected in 239 of 2307 patients (10.4%), and these cases were taken as the study group. Cases without any infectious agents (n = 1800, 78%) were considered as the control group. When the study and control groups were statistically compared in view of macrophages and neutrophil leukocytes, a significant relationship between presence of fungal infection, macrophages and neutrophil leukocytes was detected (P < 0.05). Furthermore, macrophages and neutrophil leukocytes were found to work against the fungal infection together (P < 0.05). Additionally, when the relationship between the existence of yeast or filamentous forms and these immune cells were evaluated, a significant correlation was not found (P > 0.05). Conclusions: Our findings indicate that macrophages and neutrophils may play a determining role in host defense against fungal infection together, but neither yeast nor filamentous forms affect the presence of neutrophil leukocytes and macrophages. As a result of this, both yeast and filamentous forms may have pathogenic effects. Background: Urinary cytology has low sensitivity and specificity in urinary neoplasm. Aim: We planned to assess whether the examination of bladder washing before biopsy (WBB) plays a role in better cytologic diagnosis of bladder wash fluid collected after biopsy procedure (WAB) in papillary urothelial neoplasms. Materials and Methods: We included 36 patients with papillary lesion of bladder. Prior to the biopsy, the bladder is washed and fluid is collected for cytology; later transurethral resection (TUR) is performed, then bladders are washed again and the fluid is separately collected for cytology. Both fluids were centrifuged and stained with May-Grünwald Giemsa (MGG). First the WAB slides were evaluated and diagnosed. After evaluation of the WBB slides, the WAB slides were rediagnosed. Presence of cellularity, papillary structure, fusiform cells, background bleeding, and cytolysis in WBB and WAB were evaluated separately. Results: We determined that 31 WBB samples were hypercellular, and 12 of them remained as hypercellular in WAB. Papillary structures were observed in 20 WBB samples; and in one WAB cytology. In 29 cases where no fusiform cells are identified in WBB, 22 showed fusiform cells in WAB. Cytolysis in WABs was noted in 15 cases whose WBBs did not show cytolysis. The decrease in cellularity, papillary structure (P < 0.001, both), cytolysis (P = 0.008), and fusiform cells (P < 0.001) were statistically significant. After seeing the WBB slides, we reevaluated the WAB slides. Out of the eight out of 36 (22.2%) samples diagnosed with degeneration previously, five (62.5%) samples were rediagnosed as benign, two (25%) as cytologic atypia which favor reactive, and one (12.5%) as malignant. Conclusion: Due to the better quality, initial evaluation of WBB may help more effective diagnoses of WAB slides. Background: Percutaneous lung biopsy is now a common procedure in pulmonary medicine, and several different techniques are in use. The most common has been the use of a fine needle under computed tomography (CT) guidance combined with the trucut needle for histology. Aim: To evaluate the effi cacy of fi ne needle aspiration cytology (FNAC) and immunocytochemistry in comparison with trucut biopsy and immunohistochemistry in patients with localized intrathoracic lesions suspicious for malignancy. Materials and Methods: Eighty patients with localized mass lesions in the lung on imaging (chest radiograph/CT) were selected for this study over a period of 1 year. FNAC was carried out by a 22 G spinal needle after localization of the mass in the CT scan followed by guided trucut biopsy. Immunocytochemistry and immunohistochemistry were performed as and when required. Results: The mean age of our study population was 57.6 years and the M:F ratio was 4.2:1. Majority of the lesions were peripheral and in the right lung. Adenocarcinoma was most prevalent (49%), followed by squamous cell carcinoma and small cell carcinoma. Cyto-histopathological concordance was seen in 60 cases (75%). The highest rate of concordance was seen in small cell carcinoma (83.3%). The overall sensitivity of FNAC in distinguishing malignant lung lesions from benign lesions was 84.2% and the specifi city was 100%. 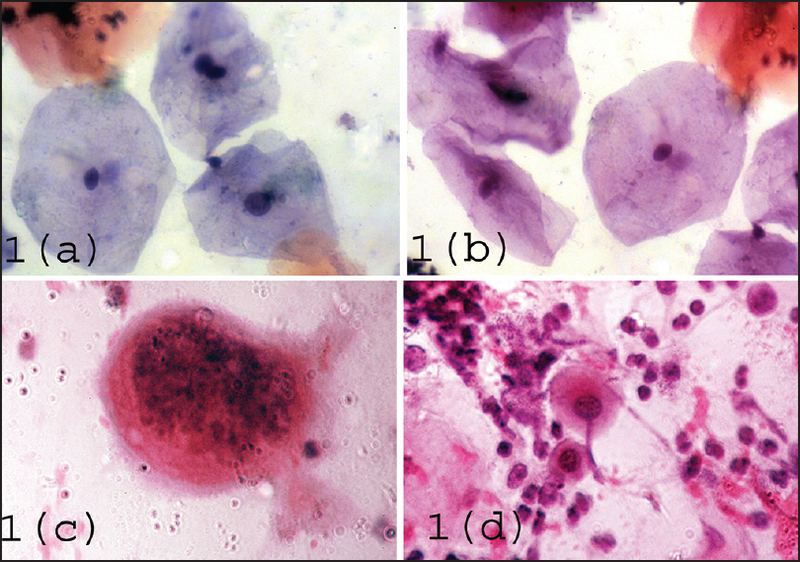 The sensitivity of cytology in diagnosing small cell carcinoma was 83.3% and of non-small cell carcinoma was 65.38%. Immunocytochemistry was carried out in 34 cases, all of which were followed by immunohistochemistry. Cyto-histopathological concordance was noted in 31 of these cases (91.2%). We used the standard panel of four markers (cytokeratin-7, thyroid transcription factor-1, p63 and CD56) for all selected cases. Conclusion: Cytology along with immunocytochemistry is highly effective in diagnosing and categorizing lung neoplasms, producing comparable results to trucut biopsy and immunohistochemistry. Background: Cytology of the endometrium is an underused technique in diagnostic pathology. It has been used in the past for endometrial hyperplasia and carcinoma. 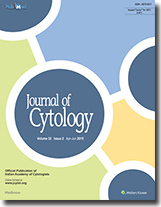 Only few studies have used cytology in the diagnosis of dysfunctional uterine bleeding (DUB). Endometrial imprint cytology has been rarely used except for application of immunocytochemistry in diagnosis of endometrial carcinoma. Aim: The present study was conducted to evaluate whether it is possible to assign histopathology-like diagnosis by imprint cytology and also to evaluate its usefulness in the assessment of patients of dysfunctional uterine bleeding of low clinical suspicion. Materials and Methods: Imprint smears were made from 93 curettage materials during a study of DUB. Blinded analysis of imprint smears was performed by using McKenzie's criteria and some criteria devised for the requirements of this study. Results of cytology were correlated with histopathology. Statistical analysis was carried out by GraphpadInStat Demo. Results: Majority of the patterns classifiable in histopathology could also be classified in this study on imprint cytology. 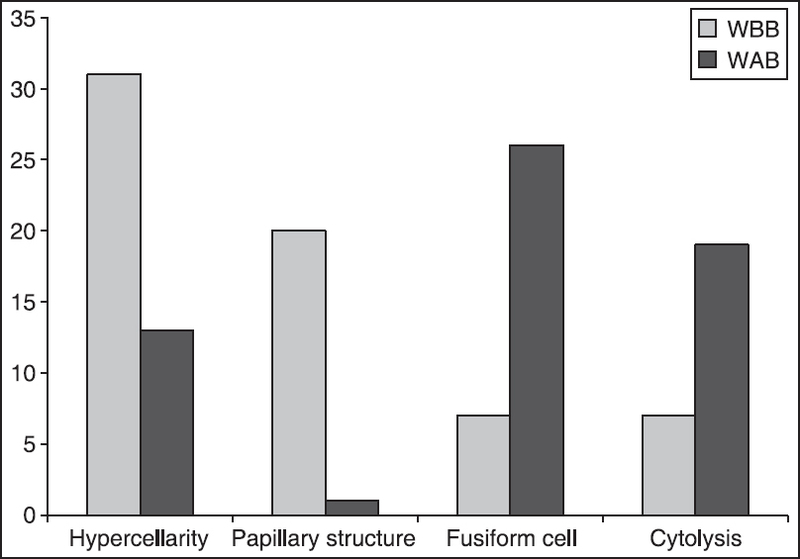 The overall sensitivity and specificity of cytology in the detection of endometrial patterns in DUB patients were 91.23% and 83.87%, respectively, although the sensitivities and specificities differ according to the phase of endometrium. Conclusion: Histopathology-like categories can be assigned on imprint smears in the diagnosis of DUB. Endometrial imprint cytology can be helpful in centers where histopathology laboratories are not available and even in well-established institutes. It is possible to improve the sensitivity and specificity with better imprinting techniques. Background: Ionizing radiation is a potent mutagenic agent capable of inducing both mutation and chromosomal aberrations. Non-lethal doses of ionizing radiation may induce genomic instability favoring carcinogenesis. In spite of their mutagenic potential, this kind of radiation is an important tool for diagnosis of the disease and is used in medical and dental practice. It has been believed that the number of micronucleus and increased frequency of other nuclear alterations, including karyorrhexis, condensed chromatin and pyknosis, are related to the increasing effects of carcinogens. Many approaches and techniques have been developed for the monitoring of human populations exposed to various mutagens, but the analysis of micronuclei (MN) has become a standard approach for the assessment of chromosomal damage in human populations. Aim: To assess the effects of radiation exposure from panoramic radiography on the buccal epithelial cells (BECs) of pediatric patients. Materials and Methods: The study included 20 pediatric patients who had to undergo panoramic radiography for further dental treatment. Exfoliated BECs were obtained and examined immediately before and 10 days after radiation exposure. The cells were stained using rapid Papanicolaou (PAP) kit. Evaluation for MN and nuclear alterations was carried out by an oral pathologist and data were statistically analyzed using the "t" test. Results: The mean number of MN in the BECs before exposure of pediatric patients to panoramic radiography was 4.25 and after exposure was 4.40. This difference was not found to be statistically significant (P < 0.0001). However, the mean nuclear alterations of 8.70 and 15.75 before and after exposure were statistically significant (P < 0.0001). Conclusion: Panoramic radiographs can induce cytotoxicity but not genotoxic effects in buccal mucosal cells. Hence, dental radiographs should be prescribed only when deemed indispensable. Aim: During the present investigation, two types of keratinized round cells (KRCs), large keratinized round cells (LKRCs) and small keratinized round cells (SKRCs), were observed in the exfoliated buccal smears of oral cancer patients. Therefore, the aim of the present study was to determine the practical utility of KRCs during difficult diagnosis and in the early detection of oral squamous cell carcinoma (OSCC) through cytomorphometric analysis. Materials and Methods: In a hospital-based case control study, exfoliated scrape smears were collected from 136 patients clinically diagnosed as suffering from pre-cancerous lesions and OSCC and a parallel set of 136 samples were also collected from non-addicted and non-cancerous healthy individuals from different regions of Odisha, and this was considered as the control group. Wet-fixed smears were stained by adopting Papanicolaou's staining protocol and counter-stained with Giemsa's solution. One thousand cells were screened and keratinized round cells along with other cytological atypia were scored. Cytomorphometry was carried out using a computer-assisted Cat Cam 1.30 (1.3 Mega Pixel) microscope camera. The findings were statistically analyzed and interpreted with respect to oral sites, age groups and sexes. Results: Cytomorphometrically, the nucleus to cytoplasmic ratio of the LKRCs was 1:4.7 in males and 1:4.3 in females, and in SKRCs it was calculated to be 1:4.6 in males and 1:5.2 in females. Conclusion: Cellular keratinization, hyperchromasia and increased N/C ratios in both LKRCs and SKRCs indicates the state of malignancy and thus the present finding has a practical value in early detection and diagnosis of OSCC patients. 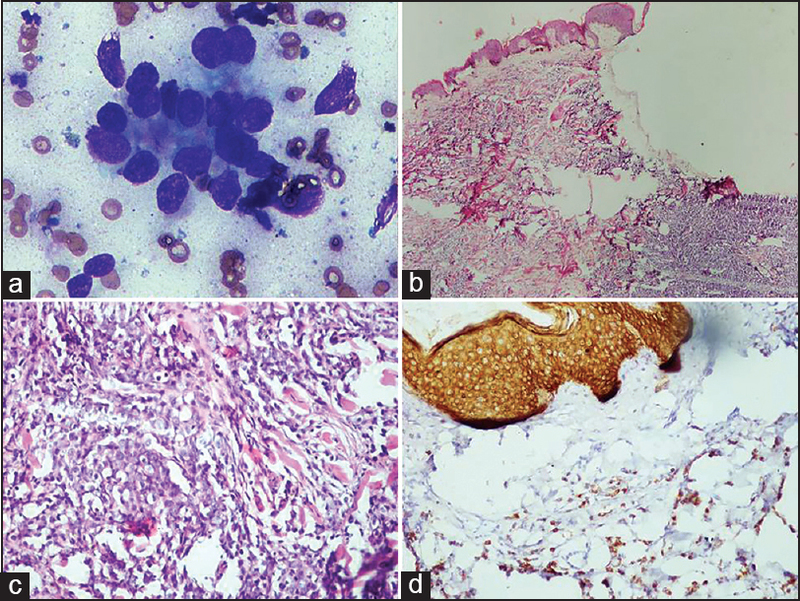 Introduction: The fixation of cytological smears using ethanol is the gold standard. But, there exists a quench to search a new alternative for it due to it being expensive, carcinogenic and not freely available. Honey has various properties, like dehydrant, anti-bacterial and antioxidant. The use of honey as a preservative in funerary practices is well documented. A thorough search in the literature did not reveal any matter for the utility of honey as a fixative in cytological smear, but its use in histopathology is well recognized. Aims: To analyze the efficacy of cytological smears fixed in ethanol and 20% unprocessed honey and to compare the efficacy between the two fixatives. Materials and Methods: The study group comprised of 30 normal healthy individuals who willingly gave written consent. Prior to the collection of buccal cells, subjects were asked to rinse their mouth with water. Buccal cells were collected using a wooden ice cream stick. Two smears were collected from each subject. One smear was fixed in ethanol and the other was fixed in unprocessed 20% honey. The slides were washed in tap water for about 30 s, following which they were subjected to the conventional Papanicolaou staining procedure. The slides thus fixed were evaluated separately for ethanol and honey. The cytoplasmic and nuclear details were scored for 50 cells in each slide. Data were statistically analyzed using the chi-square test and P < 0.05 was considered statistically significant. Results: Ninety percent of the ethanol-fixed (EF) smears were adequately fixed as compared with the honey-fixed (HF) smears, which were 80% adequate. The P-value obtained was 0.47 and the data were statistically insignificant. Conclusion: Both EF and HF smears were at par with each other, and honey can be safely used as a substitute to ethanol. Hansen's disease is on the verge of being eliminated from India and often missed by clinicians due to low index of suspicion. We present an unusual case in which greater auricular nerve thickening masqueraded as enlarged lymph node in the neck. The patient was referred for fine needle aspiration cytology, which revealed epithelioid cell granulomas suggestive of Hansen's disease. 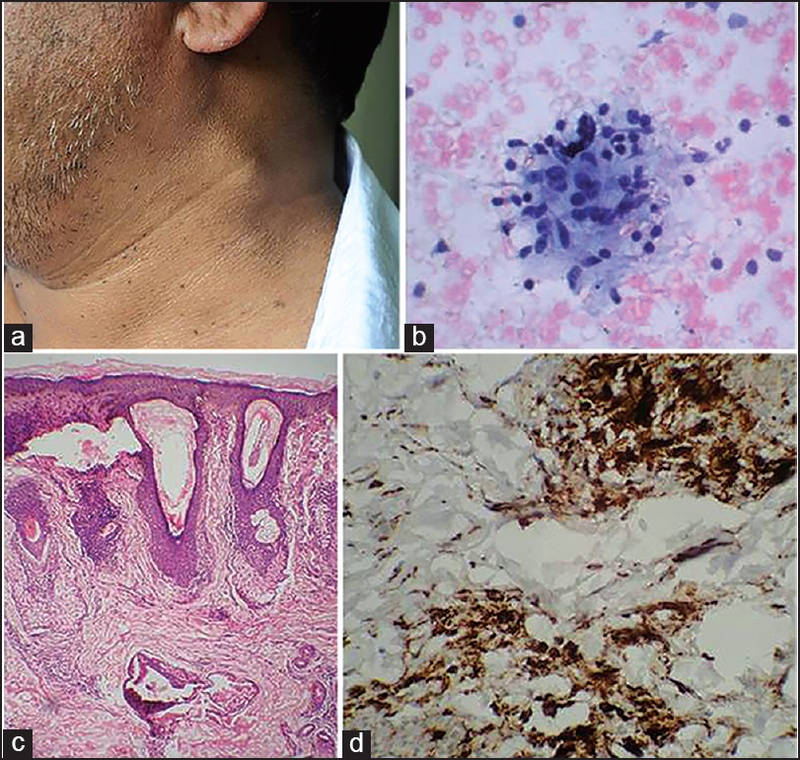 Further clinical examination and investigations including the skin biopsy confirmed the disease, highlighting the role of pathologist in the management of such unusual presentation of a common disease. Prostatic adenocarcinoma (PA) is a common visceral malignancy of elderly men. Cutaneous metastasis of PA is rare. The incidence is <1%. A 55-year-old man presented with urinary symptoms and multiple cutaneous nodules around suprapubic region, inner aspect of both thighs and scrotum. 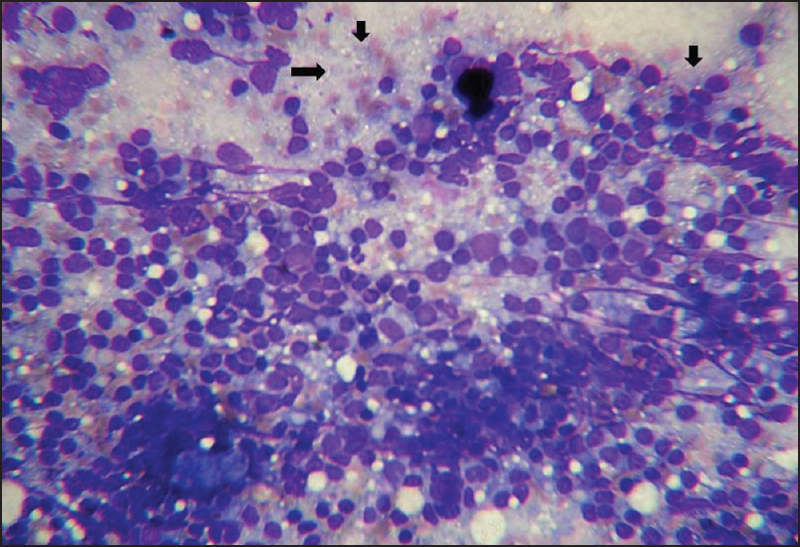 Fine-needle aspiration cytology (FNAC) of cutaneous nodules was suggestive of metastatic adenocarcinoma. Skin and prostatic biopsies confirmed the cytological diagnosis. Serum level of prostate specific antigen was raised. Total prostatectomy revealed adenocarcinoma of Gleason's score 7 (3 + 4). Though rare, cutaneous metastases of PA must be known to cytopathologists. Meticulously performed FNAC in such cases may help in early diagnosis. Filariasis is a prevalent parasitic infection of lymphatic frequently seen in tropical countries. It has been reported in cytological samples from various sites; however, presence of microfilaria in smears from the urine sample is an uncommon finding. 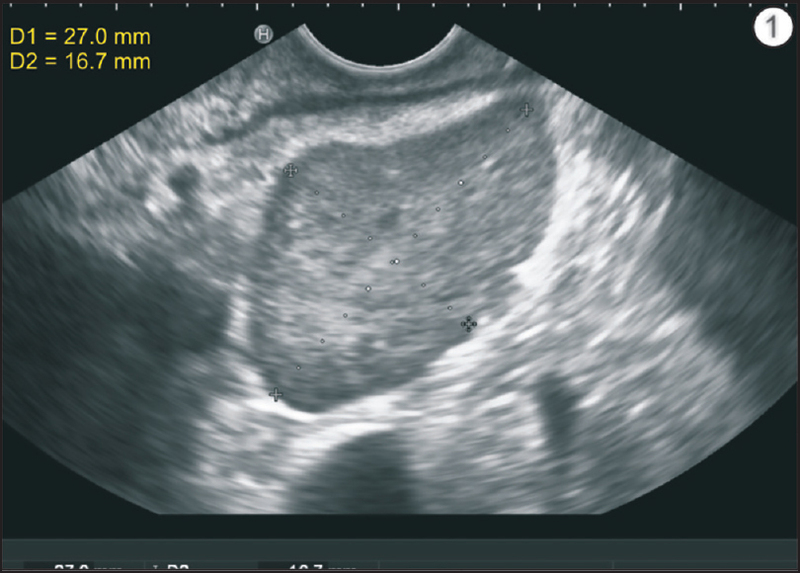 We describe an interesting and unusual case of elderly female who presented with achylous hematuria and an exophytic mass lesion in urinary bladder on computed tomography scan suspected of neoplastic mass lesion; however diagnosed as urinary filariasis on urine cytology and bladder biopsy. Primary non-Hodgkin lymphoma of breast is a rare pathology, representing 0.5% of malignant breast tumors. We report a case of 52 year old female presenting with a large painful mass in left breast with ipsilateral axillary lymph node diagnosed on fine needle aspiration cytology as non-Hodgkin's lymphoma. Breast lymphoma should be differentiated from other breast malignancies because of the differences in their treatment modalities. When breast lymphoma presents as a lump with axillary node, it clinically mimics breast carcinoma. Ultrasonogram and mammogram shows no characteristic features that can distinguish it from other breast malignancy. In such cases, FNAC becomes an important diagnostic tool that can differentiate PBL from other breast malignancy and avoid unnecessary surgery. Syringocystadenoma papilliferum is an uncommon benign adnexal tumor occurring most commonly on scalp and face. The clinical presentation varies from nodular swelling to ulcerated lesions. The lesion was on a rare site (eyebrow) was diagnosed cytologically. Radiological analyses in a 61-year-old patient being followed since 2005 for low-grade, non-invasive urothelial carcinoma (UC) (Ta) revealed a 5-cm pleural-based mass in the lower lobe of the right lung for which a subsequent transthoracic fine-needle aspiration cytology was performed. Upon observing the carcinoma cells consistent with UC metastasis, systemic chemotherapy was commenced. The patient underwent a metastatectomy based on the thoracic computerized tomography scan performed on the 4 th month of treatment, which revealed notable regression. The resected tumor was morphologically similar to cells seen in the transthoracic fine-needle aspiration and was immunohistochemically positive for p63, uroplakin, thrombomodulin, CK7 and CK20 at varying degrees but was negative for TTF-1. 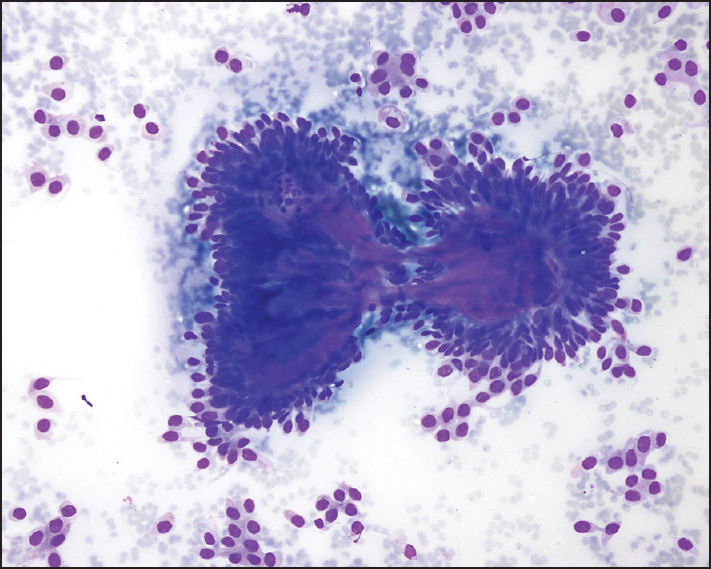 We report a case of metastatic UC of the lung in a patient who had had a low-grade superficial UC of the urinary bladder and we discuss the cytopathological features of this rare entity in light of the literature. Small cell osteosarcoma (OS) is a rare histological variant of OS that poses unique diagnostic difficulties. We present a case of a 10-year-old child who underwent fine needle aspiration cytology (FNAC) from a mass in the right thigh. 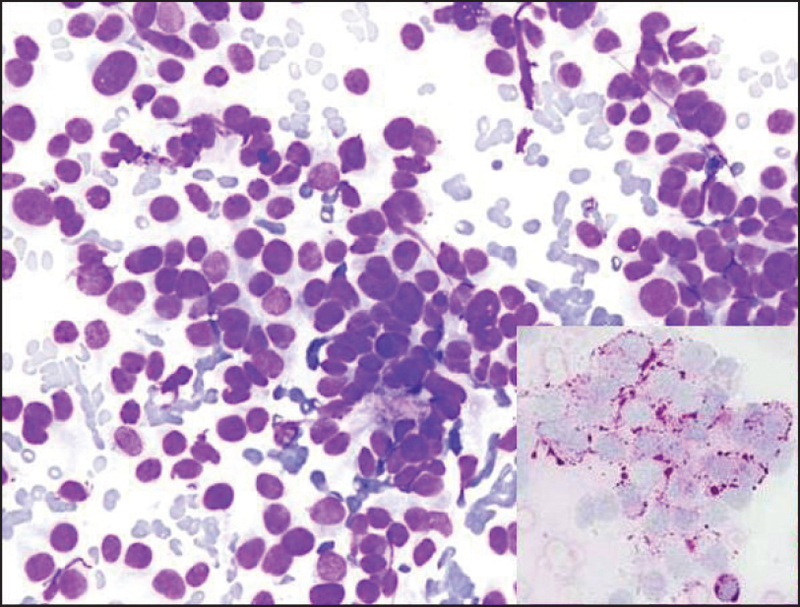 The cytological findings were those of a malignant small round cell tumor, closest to small cell OS. The FNAC findings were confirmed on histopathology. Primary ovarian choriocarcinoma is a rare neoplasm that can be gestational and non-gestational in origin. It accounts for one in 369 million pregnancies. Both types present with similar clinical, histomorphological and ultrastructural findings. But, it is essential to differentiate the two because the gestational type has a better clinical course and responds to single-agent chemotherapy. Usually, the gestational ovarian choriocarcinoma is metastatic from uterine choriocarcinoma and follows antecedent pregnancy and is seen in females of 40 years or older. DNA polymorphism analysis showing the presence of paternal genes in the tumor establishes the gestational origin of choriocarcinoma. 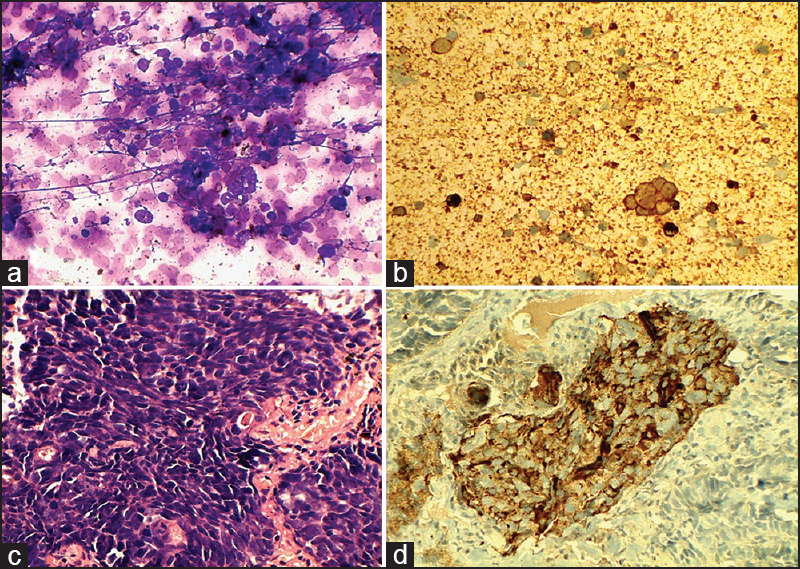 We present the intra-operative cytological findings of a case of primary ovarian choriocarcinoma in a 25-year-old lady arising from ectopic pregnancy with Ki67 immunostain. Endoscopic ultrasound-guided fine-needle aspiration (EUS-FNA) is nowadays widespread minimally invasive procedure for diagnosing a large number of benign as well as malignant lesions. 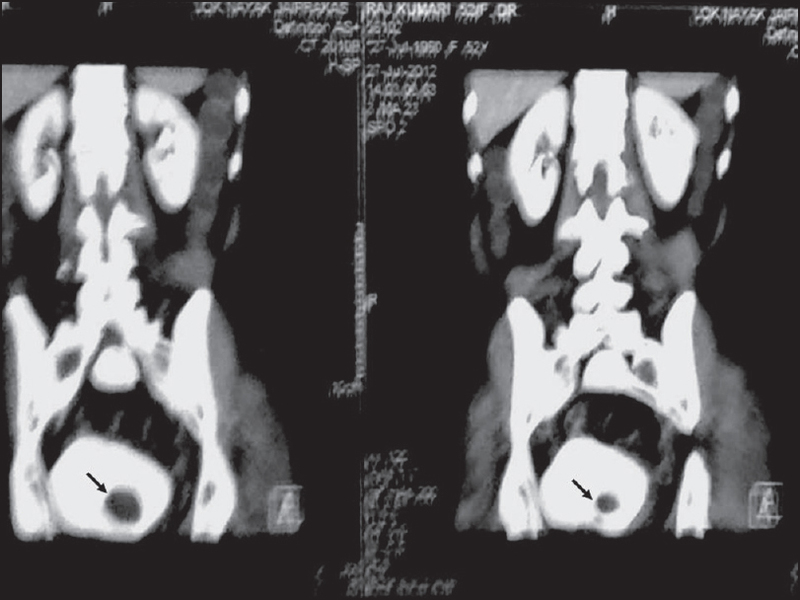 We report a case of a 62-year-old immunocompetent elderly male, who presented with high-grade fever, hepatosplenomegaly and mediastinal and intra-abdominal lymph nodes. He was residing in an old haweli with bats infestation. EUS-FNA of the subcarinal and the preaortic lymph node clinched the diagnosis. 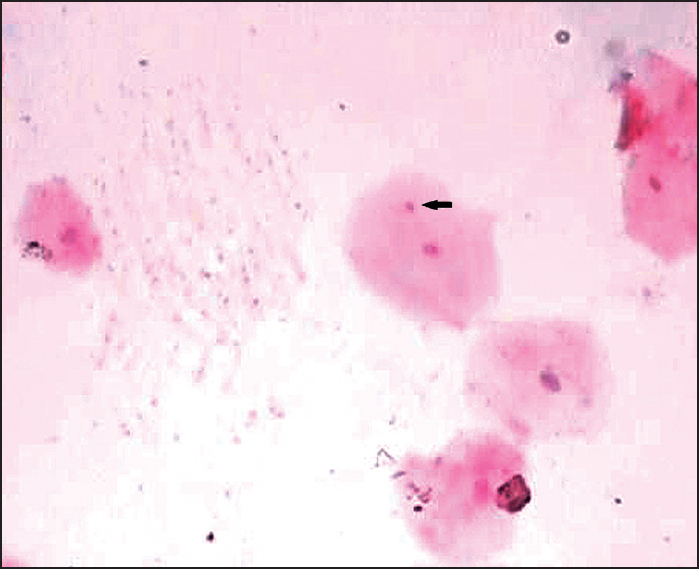 A rapid on-site evaluation of the cytology material revealed organisms conforming to the morphology of Histoplasma capsulatum. The patient was immediately started on amphotericin B and itraconazole and responded well. 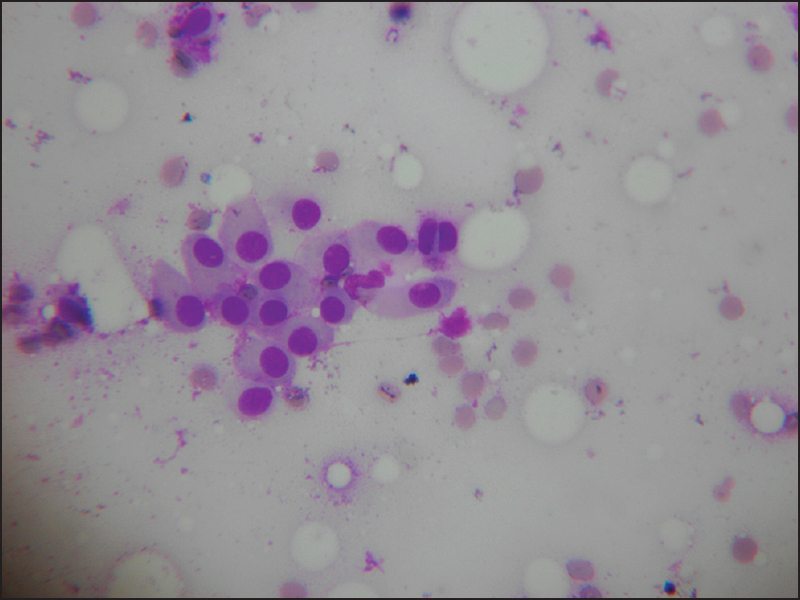 In this case, we found the role of EUS-FNA not only in diagnosis, but also in the follow-up of the patient.